PLEASE EXCUSE OUR OUT OF STOCK PRODUCTS AS WE WORK TO BRING YOU OUR NEW PACKAGING AND IMPROVED TREATS!!! WE APPRECIATE YOUR PATIENCE AND COMMITMENT TO OUR HEALTHY TREATS! We are proud to offer your companion a selection of uncompromised, eco-friendly, dog treats using only the freshest 100% organic, non-genetically modified organisms (non-GMO), and human-grade ingredients. We love making our nutritious dog treats as much as dogs love eating them! We’re glad you’re here. Come sniff out our site. 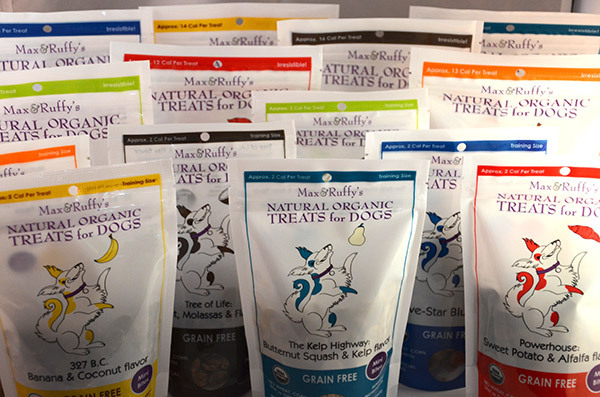 Max & Ruffy’s is proud to offer you the best dog treats you can find for your companion! Our healthy dog treats are not your ordinary dog treats. Max & Ruffy’s flavors are concocted to be unique, while using beneficial ingredients that contribute to the health and well-being of your dog. Our natural dog treats are made using 100% certified organic human-grade ingredients sourced from socially responsible companies. From our “Powerhouse” sweet potato dog treats, rich in beta-carotene, vitamins, minerals and other nutrients, to our anti-oxidant packed “W.P. Pizza”, our oven-baked organic dog treats supply your dog with both nutrients and irresistible flavor. Our line of nutritious dog treats includes both wheat free dog treats and grain free dog treats. Max & Ruffy’s human grade ingredient dog treats do not contain any genetically modified organisms, offering your dog the best non GMO dog treats and healthy dog treats available. 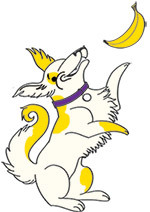 Here at Max & Ruffy’s we do not use any animal ingredients in any of our products in order to supply the very best vegetarian dog treats and vegan dog treats on the market. Our treats are as close to homemade dog treats as you will find. friendly and the resealable bag keeps treats fresher longer. Max & Ruffy’s are truly eco friendly dog treats making them a positive choice for both your dog and the environment. Max & Ruffy’s all natural dog treats come in two sizes: original and mini bites. Our “mini bites” are small dog treats that are perfect for little mouths, training, portion control, or filling your dog’s favorite toy. We love to bring you treats that dogs love! We’re glad you have found us and your dog will be too!